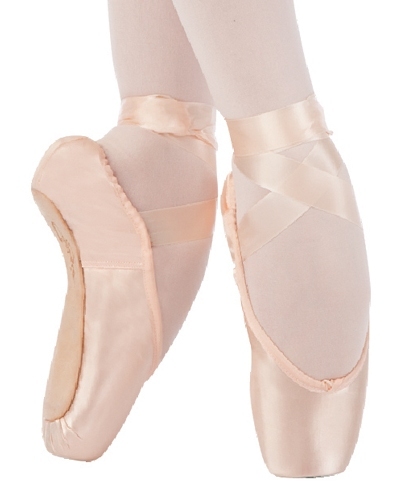 Capezio X126 Tiffany pointe shoe features a standard feathered toe box and wings, nylon binding and elastic drawstring to match upper, and a leather sole. Other features include a low vamp, sides and back. This shoe has So Suede lining throughout the shoe providing a moisture absorbent and anti-microbial environment for the foot. It reduces foot odor, reduces mildew rot and fungus growth. So Suede also provides abrasion resistance with a soft and comfortable feel,#3 leatther board shank 3/4 skived to zero. Capezio's suggested fit Capezio Tiffany X126 : Order same to half (1/2) size larger than your regular USA street shoe size.